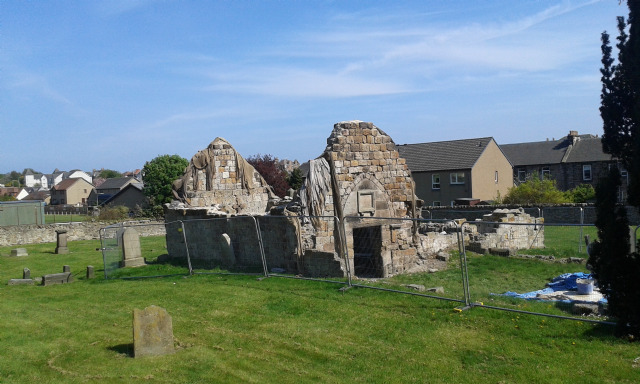 In early 2013, after centuries of neglect, a meeting was convened in the Kirkton churchyard between members of Burntisland Heritage Trust (BHT), Local councillors and officials from Fife Council to agree a way forward for the endangered building. It was agreed that removal of the ivy obscuring the building was essential before the weight damaged the walls. A Scheduled Monument application was submitted to Historic Scotland (HS), seeking permission to remove the ivy. 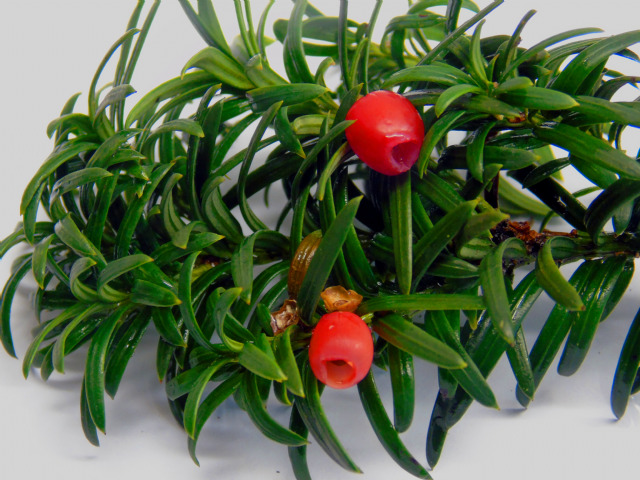 HS advised that an Architectural Advisory report would be required prior to the removal of any ivy in order to establish the scope of works required to stabilise and secure the ruin. Due to the potential cost of the work involved and the limited resources available to Fife Council it was agreed to explore the possibility of external funding. 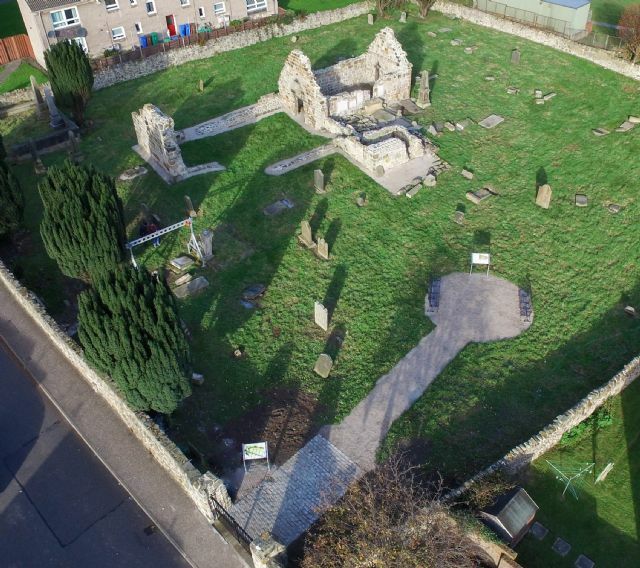 Agreement was reached that BHT and Fife Council would work together to take forward an application for the full conservation of the church ruins, including the wider interpretation and promotion of the site. This was confirmed at a meeting of both partners in February 2014. The Heritage Lottery Fund (HLF), was identified as principle funders and Initial enquiries were encouraging. Support within the town was strong and positive feedback received from the various churches in the town and especially primary school. The full backing of the Community Council was assured. A working group was convened consisting of representatives from Burntisland Heritage Trust, Burntisland Community Council, Fife Council and Floral Action Burntisland. In December of 2014 a site visit was arranged with representatives of Historic Scotland to agree the scope of works required to secure Scheduled Monument Consent. It quickly became apparent that what had initially started as a project to secure the integrity of the ruin was turning into something much larger. The beautiful setting of the Kirkton Church and the peaceful feeling within its boundary walls would lend itself to greater community use. Examination of the gravestones and closer reading of the available records emphasised the important part this church had played in the community for nearly a thousand years. The Working Group decided to go for a full conservation of the church ruin, installation of interpretation panels, seating and the creation of an educational and interpretation pack. Funding would also have to be found for repairs to the boundary wall and grave stones and for environmental work. Due to the scope of the planned work it was decided it should be tackled in two stages. Stage one removing the ivy and stabilizing the walls, the second stage conservation of the ruin, installation of interpretation panels, seating, repairs to monuments and general environmental work. During the first half of 2015 quotations were sought from specialist firms for architectural and archaeological work, ivy removal etc. Applications for funding of the initial stages were also being submitted. An application for Heritage Lottery Funding was submitted in July 2015. We were advised in October 2015 that we had been successful in our application and had been awarded £90,500. This left us with £30,500 to raise from other sources. The acceptance by National lottery boosted everyone’s confidence and also gave the project a sound foundation. Meanwhile applications for funding were being sent out and quite a number of rejections received. We were fortunate in receiving funding in kind from Fife Council Bereavement Services and Building Services for work on ivy removal. An initial payment of £3000 was received from Burntisland Common Good Fund and £3100 from Fife Council Ward Fund. In January 2016, we were delighted to be awarded £1500 from the Co-Op Local Fund. January 2016 saw the appointment of Steve Newsome as architect of the project and “AOC” appointed as Archaeologists for Phase 1 recording and surveying the site. ‘Impressions In Stone’ won the contract for Phase 1 stabilisation of the ruin, ivy removal and removal of loose stones and rough racking the wall-heads. None of this could start until the heavy overgrowth of ivy had been removed. Fife Council staff sprayed the ivy with a herbicide and this would require several weeks to take effect. January also saw the launch of a dedicated website www.kirktonoldchurch.org.uk to record and present the work being carried out. In March we were delighted to be offered two custom made metal benches by Archway Metals of Kinghorn, this was a wonderful gesture and freed-up several thousand pounds for use in other areas. AOC archaeology was on site using laser scanning to record the building in digital form providing both ****** and 3D coloured images. Investigations were also being made to discover any early written history. April saw ‘Impressions In Stone’ on site, chemically treating the ivy roots and removing loose stonework. In May the project received confirmation of funding from FET (Scottish Landfill Communities Fund), this amounted to 12% of the total cost of the project; We were nearing our target! By June of 2016 funding was continuing a pace and phase 1 well under way. Steve Newsome was appointed to undertake architectural supervision of Phase 2 work. ‘Impressions In Stone’ had completed stabilisation work and the structure was at least safe from water ingress and serious deterioration. An important consideration when first discussing the project was involvement of the community, with this in mind graveyard consultant Dr. Susan Buckham of ‘Kirkyard Consulting’, was appointed to develop educational activities and interpretation resources. A slight hiccup occurred when all the tenders received for phase 2 came in over budget. This was treated as an opportunity to look again at the specs for this part of the project and examine where savings could be made and where, if possible, money could be found to make repairs to the boundary wall. This caused a slight hiatus in the project which was relieved by an on-site visit in October by Prof. Richard Fawcet, a leading authority on medieval Scottish church architecture, and David Borthwick of Historic Scotland. An informative couple of hours was spent examining the now fully exposed and partially conserved ruin. In December 2016, ‘Forth Stone’s’ tender for phase 2 was accepted. Due to the delay caused by having to re-run the tendering process, it was too late in the year for work to commence. A starting date of 27th March 2017 was suggested. During this period Ian Archibald and John Burnett were re-mapping and re-listing the headstones in the graveyard. New stones had been uncovered and both Ian and John were working with Susan Buckham in preparing the information for the proposed interpretation publications. For the first panel it was decided to commission artist Chris Mitchell to produce a reconstruction drawing of the Church. A date of Lammas Fare in 1540 was chosen. This would show the church pre-reformation and during a fairly prosperous period for Burntisland. The second panel would show the churchyard. Artist Carmen Moran, who had previously worked with Susan was chosen to collaborate on a theme for the second panel. Ongoing juggling of work, and savings in certain areas allowed for more money to be spent on boundary wall repairs, this was to be carried out by Forth Stone and would take the project into August 2017. Forth Stone moved on to the site at the end of March 2017. Discussion was also taking place with regard to gravestone repair. It was decided that any money left in the contract price for Forth Stone after boundary wall repairs could be used for gravestone work however, the majority of repairs would be done by Fife Council Bereavement Services specialist staff. Ian Archibald had finished re-mapping the churchyard by June and the gravestones had been indexed. Susan had come up with a theme for the interpretation literature, Tales of Tides, Tilling and Travel', this reflected the recurring themes identified on the gravestones. It was decided that there was sufficient money in the funds to produce a leaflet and in July Carmen Moran was asked to come up with designs based on the theme suggested by Susan. After discussions, it was agreed that up to £10,000 could be spent on repairs to headstones. The stones in most need of attention had to be identified and Bereavement Services carried out a Health and Safety Inspection. With the Health and Safety report and with input from Susan Buckham, a list of stones in most urgent need of attention was identified. The majority of on-site work was complete by the end of 2017; there were several memorial stones needing attention but all stones in a dangerous condition had been levelled. It was decided to delay re-opening the site to the public until the spring of 2018 to allow for final repairs to the headstones and to clean-up the site. A short reopening ceremony was held on Palm Sunday 25th March 2018 to celebrate the restoration work.